This was my first try at beef stew and it was pretty good! 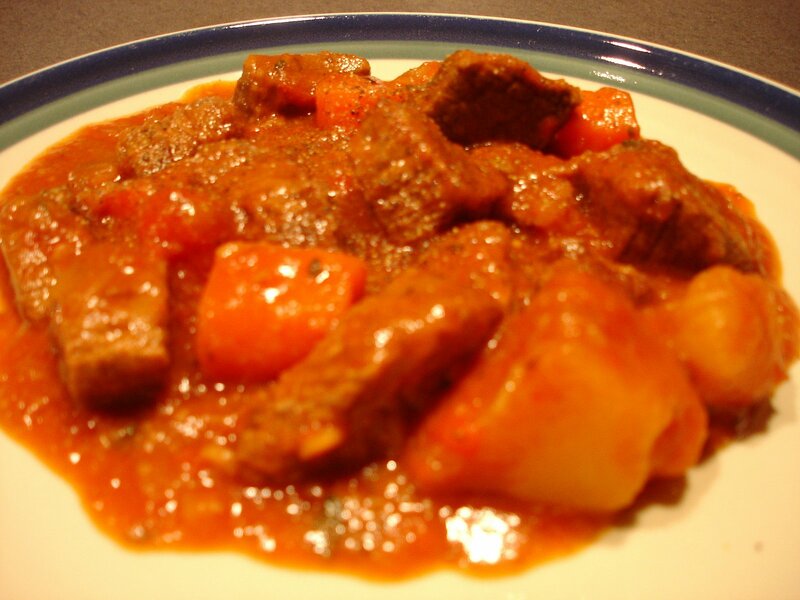 (EDIT: Click here for my new favorite beef stew recipe). To come up with the recipe, I thought about the flavors, talked to my mom about her beef stew, and read a bunch of recipes. I also got some advice on the cut of beef from a friend who is an amazing cook. I came up with my own recipe and was quite pleased. The only change I'd make next time is to use less of the tomato juice and more of the beef gravy. The picture doesn't look that good, but believe me, it tasted great!! Marinate the beef in the wine and garlic. Sear the beef in a large pan; transfer to a stew pot. Add carrots, potatoes, and parsnips, stir. Add tomatoes and gravy, stir. Bring to a steady simmer and then reduce to low for 2-3 hours, stirring occasionally. Adjust seasonings if necessary and serve. Yesterday was our first snowfall so this beef stew along with some fresh crusty bread was perfect!